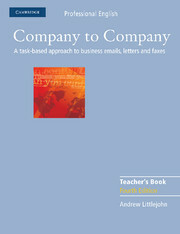 Company to Company is for anyone studying or working in business, commerce or administration who needs to correspond in English. 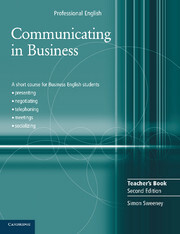 It is particularly suitable for learners at the lower-intermediate and intermediate levels, but more advanced learners who are unfamiliar with business correspondence will also find it invaluable. The fourth edition of this highly successful course contains thoroughly updated content and includes extensive work on email correspondence. It follows the successful interactive task and feedback approach of the previous editions.